Sick of waiting for volatility to return to the markets? Seems that the folks at ICE are too and they’re doing something about it. In two days, futures on FANG stocks – you know – Facebook, Amazon, Apple, Netflix, and Google – will be traded on the Intercontinental Exchange as a FANG+ futures contract, merging the built-in leverage and liquidity of futures contracts with the seemingly endless promise of today’s five horsemen of techno-wonder. FANG+ includes more than just the five stocks that make up the acronym (actually that’s FAANG, and actually, actually – it would be FAANA, as Google is now Alphabet, but we digress). 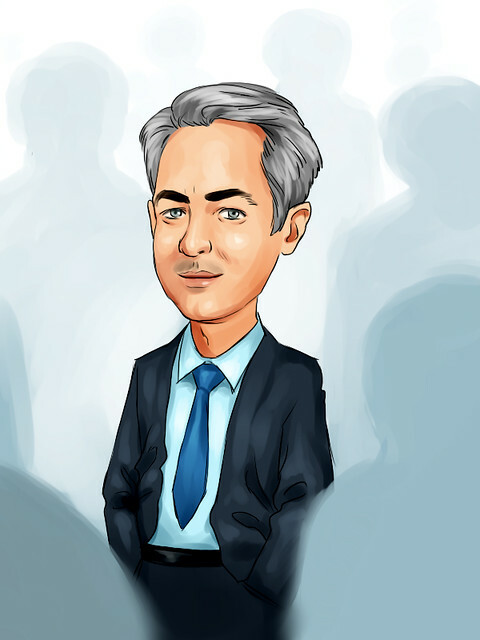 FANG+ will also include five other tech stocks (10 total) like Tesla and Baidu to better represent all of the top tech companies, in a move designed to bring more diversification to the index, but also to avoid the joint SEC/CFTC jurisdiction by being a broad-based index under the jurisdiction of the CFTC alone. Here’s the full 10 company index composition, per ICE’s page announcing the new contract. The index will be equally weighted between the 10 stocks. Rebalances will occur quarterly on the third Friday of March, June, September, and December. For more information on the inner workings of the index, see ICE’s methodology here. Backtested, it’s done well since 2014, beating out a very bullish stock market run, showing a 28% annualized return. .10 Index points, equal to $5.00 per contract; calendar spread trades may be executed at .05 index point increments. Third Friday of the expiration month. Trading in the expiring contract ceases at 9:30 am NY time on Last Trading Day. Cash settlement to a special calculation of the NYSE FANG+ Index (Price Return version) based on the opening prices of the component stocks on the Last Trading Day for the contract. Position Limit – 100,000 lots in all months combined. What was the spark to launch an index? Well, these exchanges are infamous in the business of making money these days, not just member-owned enterprises like the good old days. So, the launch of a new product – like VIX futures over the CBOE or the CME’s upcoming foray into Bitcoin – can be the catalyst to more volume, more revenue, and more profits – something the FANG stocks know well. So how much more VOL are we talking about, exactly? 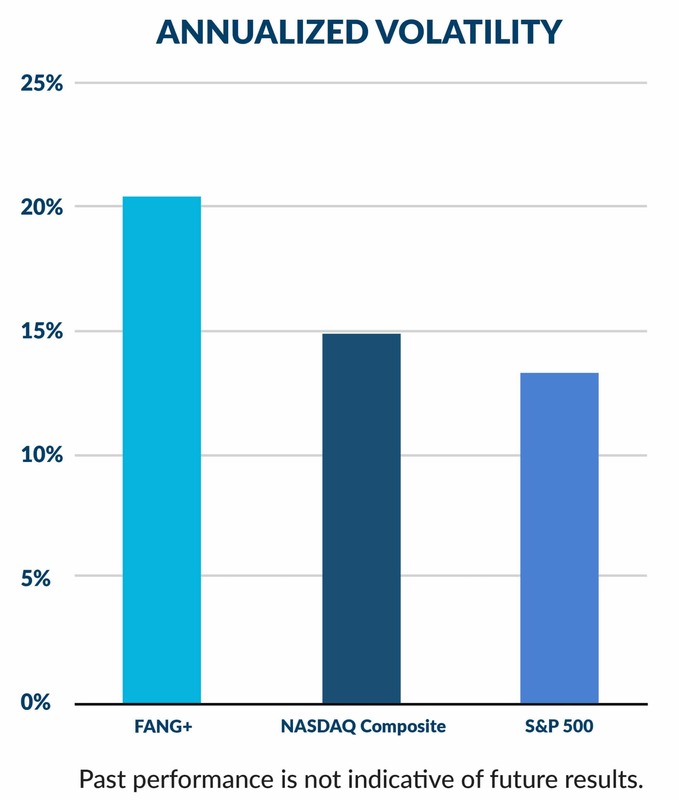 We got FANG+ Index data back to September 19th, 2014 and ran the annualized volatility of the FANG+ Index against the S&P 500 and the NASDAQ. Turns outs, FANG+ volatility is nearly one and three quarters that of the S&P 500 and one and a quarter times the NASDAQ. Not too shabby. What’s that mean for traders? Well, there’s more than one way to evaluate volatility, and for those traders who like to get in and out of a market scalping ticks and points here and there – traders in the space will give much more weight to the dollar trading range of the FANG+ Futures (a.k.a how much money can be made and lost each day on the average market move (in dollar terms). Think of it like paying for volatility, and assessing how much volatility you get per contract traded. With roughly 30 days of data from ICE, we found the daily range by subtracting the high minus the low, multiplied that range by 50 to get how much one contract of the index could potentially make/lose each day, and averaged the range to arrive with the FANG+ Index Futures having a range roughly two and a half times the range of the Emini S&P, and one and a half times the trading range of the NASDAQ Composite. 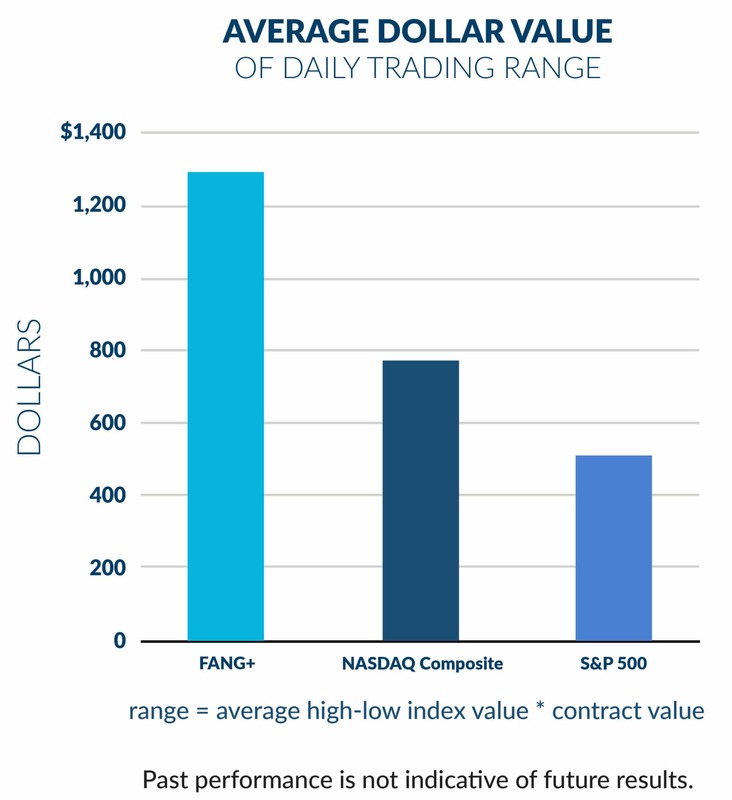 With roughly equal fee levels ($1.20 for the Fang futures traded electronically, as compared to $1.18 for emini index futures on the CME), you can see Fang is designed to give you more bang for your buck. We’re more than curious to see how this product launch is treated by both the professional trader space and retail traders. No doubt, there are professional systematic traders who would have loved to be long the trend outlined in the index chart above. And no doubt there are retail traders who are thirsting for a little more opportunity each day (and more familiar with the names in this index than any other futures product). We’ll be watching to see what liquidity looks like the first couple of months, and report back how the product is being adopted by professional trading groups. Author: Attain Alternative BlogAttain Alternatives Blog is a compilation of thoughts, research, attempts at humor, and more from the team at RCM Alternatives.